If you are looking for a yummy, healthy salad you are in the right place! This Quinoa Superfood Salad Recipe is easy to prepare, great to have for the week, for a party, tastes great and looks pretty too. When I make this salad it sure doesn’t last for long. For my health nuts, this salad is gluten free, dairy free, soy free, nut free, low glycemic, tastes great and is good for you. Who could ask for more?! Rinse quinoa. Bring 2 cups water & 1 cup uncooked quinoa to a boil in a medium saucepan. Reduce heat to low, cover and simmer until tender and most of the liquid has been absorbed, 15 to 20 minutes. Fluff with a fork. While quinoa is cooking rinse & massage the kale. Massage the kale taking a small handful at a time and rubbing it between your hands. You will notice the kale leaves get darker. This help to breakdown the fibers of the kale so it is a bit softer and easier to chew. Chop kale into bite size pieces. Chop carrots, red cabbage, jicama and dice avocado. If quinoa is prepared ahead of time it will be cool when added to salad. If not, no worries, fluff a bit more to help it cool and place in large salad bowl. Add the rest of the ingredients and mix. Walla – Another Easy Healthy Recipe! Super Yummy!! You can eat a big bowl for a meal. It’s easy to transport when bringing your lunch to work too. And great to have already prepared when coming home after a long day – dinner is ready. Woohoo!! Feel free to share this recipe with your friends. 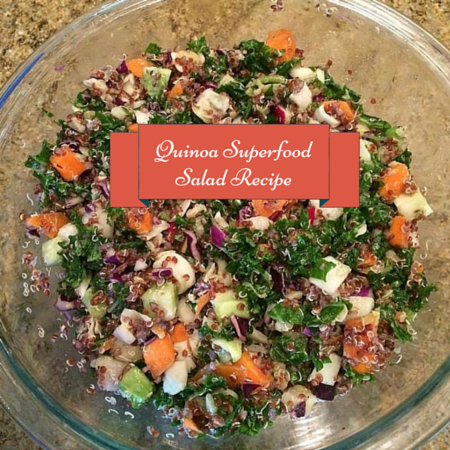 If you enjoyed this Quinoa Superfood Salad Recipe, I would greatly appreciate it if you commented below and shared on Facebook & Twitter. P.S. If you want more quick healthy recipes, enter your name and email below for our Free 5-Day Starter Plan.